Beautiifully crafted 1.37 Carat Ruby and Diamond Pendant in an exclusive 14 Karat White Gold Amoro design. An stunning 1.37 Carat Ruby and Diamond Pendant featured with an oval cut genuine Ruby weighing approximately 0.98 Carat surrounded by sparkling baguette and round cut Diamonds in an exclusive 14 Karat Amoro Heart prong design. 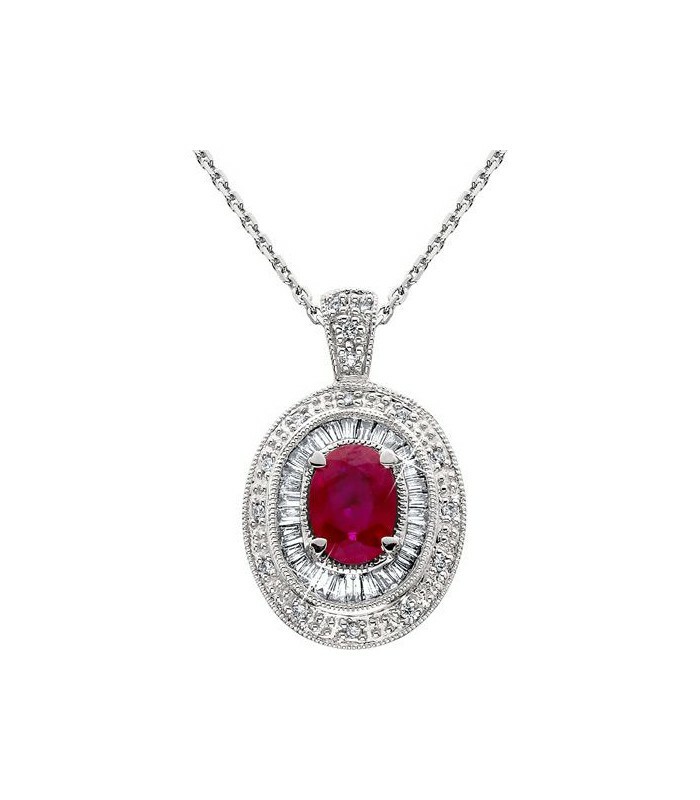 *PENDANT* One (1) fourteen karat (14K) white gold Ruby and Diamond Pendant, featuring: One (1) prong set, oval cut, Genuine Ruby weighing approximately 0.98 carat and Thirty-seven (37) prong set, round brilliant cut, Genuine Diamonds weighing a total of approximately 0.39 carat. Complimentary 14 karat white gold Amoro adjustable length chain.